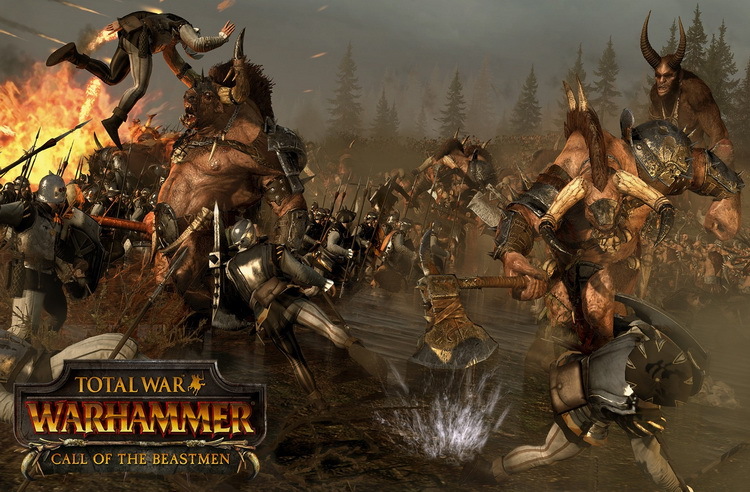 The Call of The Beastmen introduces “The Beastmen” as a playable race to Total War: WARHAMMER. A feral, Chaos-tainted horde race, they move like a plague across The Old World, fielding half-human aberrations and colossal beasts in battle, many of which feature unique abilities. The Beastmen are playable in the Grand Campaign, custom and multiplayer battles, and in their very own Story Campaign, An Eye For An Eye. As The Beastmen emerge from their woodland lairs, ten thousand hooves stamp in agitated union, and a foetid musk arises from the sea of matted fur. The Beastmen represent another successful transition from tabletop to Total War: Warhammer faction. Overall, this expansion sets a pretty encouraging tone for the factions and races to come. Refining the Chaos horde mechanics, adding some Orcish fury, and the overtone of Guerilla ambush tactics, gives the Beastmen a play-style that deftly meshes tabletop fiction with in-game mechanics.